Unicat actually uses a diamond shaped pattern; the front and rear mounts rotate side to side, the center mounts forwards and back. My camper is a 4 point diamond mount too, front and back mounts pivot left/reft and the center mounts are rigidly attached. How much twist will you get from that chassis after you have made it more rigid? Will you need a multi-point torsion free mount? I would not of thought it would bend that much considering the cab is firmly attached to it, there is a down side to torsion free mount and that is it raises your camper box about 6 inches. Charlie and my campers need the torision free mounts due to how twisty a mog frame can be but everything on the frame is torsion free. I am not sure what Charlies unicat does but on mine the top part of the pivots and the entire subframe are built into the floor structure of the camper, allowing it to be as low as possible. On a typical mog camper there is a spider frame that mounts torsion free and the camper sits on that frame, mine combines them into one. Looking at my other 416, the camper would been raised by a lot more than 6 inches if they had done it using a stadard subframe. I can take photos if you wish. I should add that I mentioned the 4-point because for a given amount of frame flex the camper movement could be less. Let's say you have an 8' camper on a three point. When the frame flexes 6", that means you need 6" of clearance at the 'free' end of the camper. With the same flex on a 4-point, you may need 3" of clearance at each end of the camper, rather than 6" at one end. Think of solid mounting points as the 'fulcrums'. Or am I all wet? That helps a lot. I will think about the diamond style mount and see how we can make it work with our design. I trust that in your designs all four points are hard mounted to the chassis frame and are not mounted in 'series' the way a universal joint would be with the 2 lateral pivots being attached 'after' the 2 longitudinal? Do any of you have any damping / shock absorbers in any direction, the way Doug has built? Or is that not necessary once you introduce the fourth point? ROB - I'd love to see some pics if it's not too much trouble. I do not have shocks, my two pivot mounts have very tight fitting rubber bushings. I don't have any problems with sway, it does move when you are on the inside due to the suspension but no more than any other truck. You really only see the mounts moving when you are driving over uneven ground. Look at the attached pic, you can see the mount doing its thing by looking a the angle between the fuel tank and the camper box. I'll get you some close up pictures. The middle of the diamond is a long tubular structure bolted to the bottom of the camper, attached to the frame of the truck via a few inches on each side of tubular mount around the inner tube. Insulated with fairly thick rubber to absorb twisting forces which develop with a 4 point system. 3 points always define a plane, 4 don't necessarily stay in a plane. I like what this guy is doing here. Similarly, I don't care for the marketing term/label "Sport Utility Vehicle" / SUV, but prefer the old term 'Utility Vehicle'. My bias is that as the 'Sport' was added Utility was reduced. BUT, if we can get beyond the semantics these large overlanders are surely RVs or Motorhomes - and certainly the best kind. Design the box mounting system??? * The sweep of the cab-over part of the box, over the cab. * The most cost effective mounting system THAT WEIGHS THE LEAST. I wonder how many "expedition" vehicles there are out there with elaborate mounting systems....Just so that the owner can say "NO! THIS IS NOT AN RV! SEE! I'VE GOT A 3 POINT MOUNTED BOX!" I'd sure hate to see you throw good money after bad. This is really good advise, like I said before, How much will it flex when you have done all the frame mods? Some rubber bushings may be all you need. On a mog you have to deal with it, end of story, but a F650 is not know for being super flexible. I actually agree with you. The F650 is a complete unknown in terms of flex, especially with the stretch and reinforcement I'm putting on it. In the mean time design work on the 'box' is underway. Then we will finalize how to mate the two together. In the mean time I'm trying to gather opinions and learnings, so that we're ready to make an intelligent decision as soon as the time comes. If all goes well, it will be stiff as hell and I can save a few inches on my CG, and a lot of weight. I explained the mounting of the box on Casa on one of the threads in Expedition Campers, and of course I'm a day late in trying to recover that info so i'll start over. To the best of my knowledge all the posts are still there, you just can't add more. You can still link to posts at ExpeditionCampers and cut and paste from them etc. If you have any trouble send Chip a pm and he can help, or let me know. We don't want to loose all that info, it will eventually all be copied to ExPo, the old website is going to be up for a year at least in read only format. But where are the old expedition forum write ups? "Casa Azul's box was set on the frame then 6 LOOOOOONG u-bolt were feed over the box frame and straddle both the box frame & the truck frame. A plate then is pushed onto the U-bolt then a heavy die spring is set on each of the legs of the u-bolt and another plate is mounted to ubolt that sandwiches the springs. washers and nut are then added to the u-bolts, then tightened until the springs are slightly compressed. 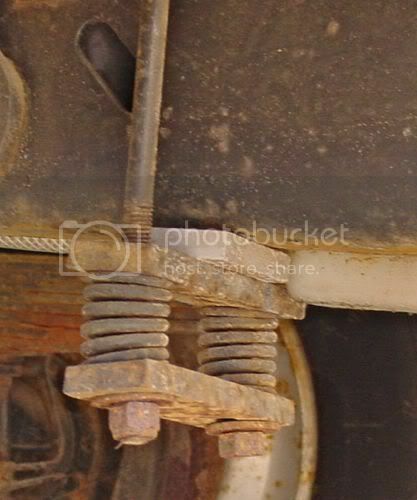 Then as the truck frame flexes, the box has the springs on the u-bolts to compensate for the movement. Granted it is not the sexiest solution, but given that Casa Azul's frame was modified into a "Z" frame (for the 4x4 running gear) there is very little flex in the frame anyway. "